Arsenal to push for Cristian Pavon transfer? 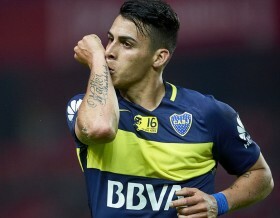 Arsenal are reportedly planning a fresh attempt to sign Cristian Pavon from Boca Juniors when the transfer window reopens in less than 15 days' time. The Argentina international was heavily linked with the Gunners during the summer with former chief executive Ivan Gazidis highlighting the attacker as one of the club's prime targets. According to The Sun, the north London side are still said to hold an interest in the highly-rated attacker with manager Unai Emery keen on signing a forward-minded player to give his side an edge during the backend of the season. Nonetheless, the Argentine won't come on the cheap for the Gunners with Boca said to have quoted a £40m fee amid interest from other sides including Fulham. Arsenal recently witnessed their 22-match unbeaten run cease after they suffered a 3-2 defeat at the hands of Southampton at St Mary's on Sunday. They are now three points behind fourth-placed Chelsea in the standings.